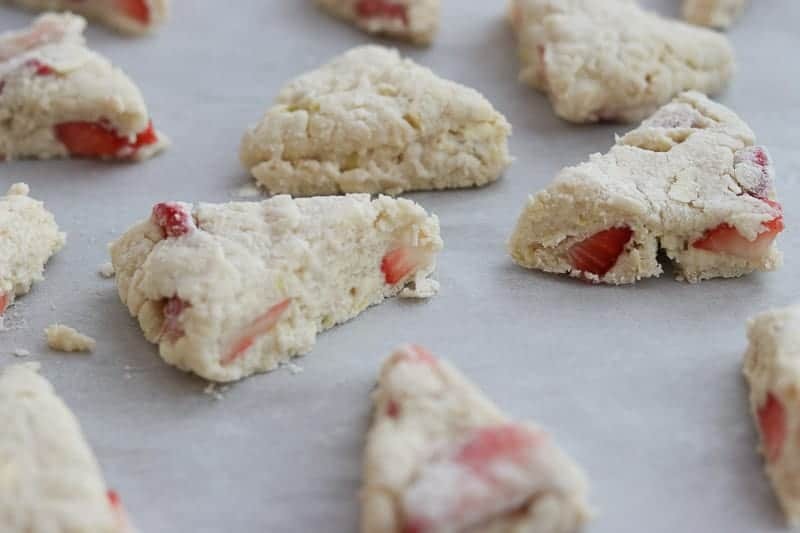 These delightful easy mini strawberry lemon scones make the perfect dessert for a bridal, baby shower or even a Mother’s day breakfast, brunch or afternoon tea. Super easy to make! Because they are mini scones, they are a bit more healthy and less calories than the big ones. Be sure and use fresh strawberries if at all possible. This recipe is the original recipe from my tea room in California – Afternoon To Remember. I have made a zillion (yes, that’s a word, or at least it’s my word) scones in my lifetime. Sometimes you don’t mess with goodness and the easiest way to “lighten” them up is to just eat less of it. I’ve made them mini size, left off the glaze (which you don’t need anyway) and am not serving them with lemon curd, which again, you don’t really need. 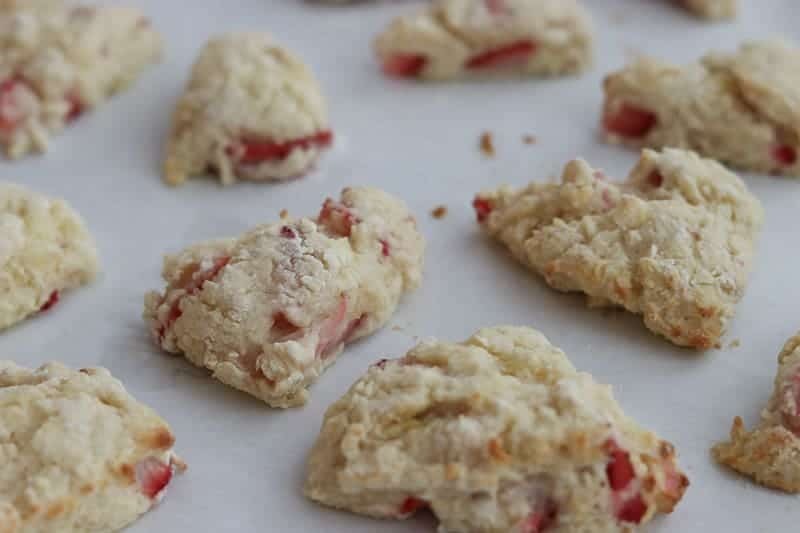 So these mini strawberry scones are somewhat healthier and absolutely great on their own. I’ve said a million times, “I’d rather eat a little piece of heaven, than a lot of yuck!” Here’s my little piece of heaven! Only 3 WW Freestyle Smart Points per scone or 83 calories. 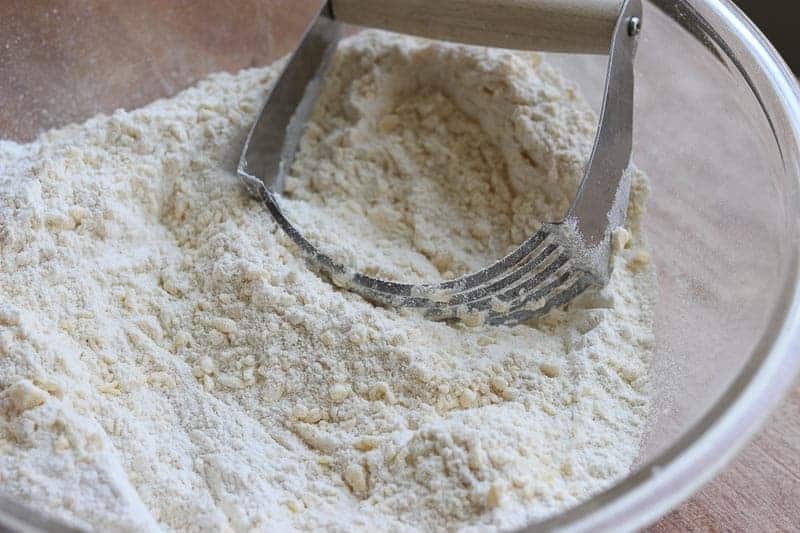 Can you make your own self rising flour? Yes! I know there are a lot of cooks who hate self rising flour. I’m a cook who doesn’t usually like shortcuts because they mess with the taste. However, in this case, self rising flour works great. 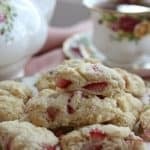 This is the exact recipe I used in my tea room for many years and we even won Best Small City Tea Room in the U.S. one year. Obviously I think self rising flour is perfectly fine for scones, but you can definitely make your own self rising flour. In a small bowl, combine above ingredients. Makes 3 cups. Proceed to scone recipe down below. 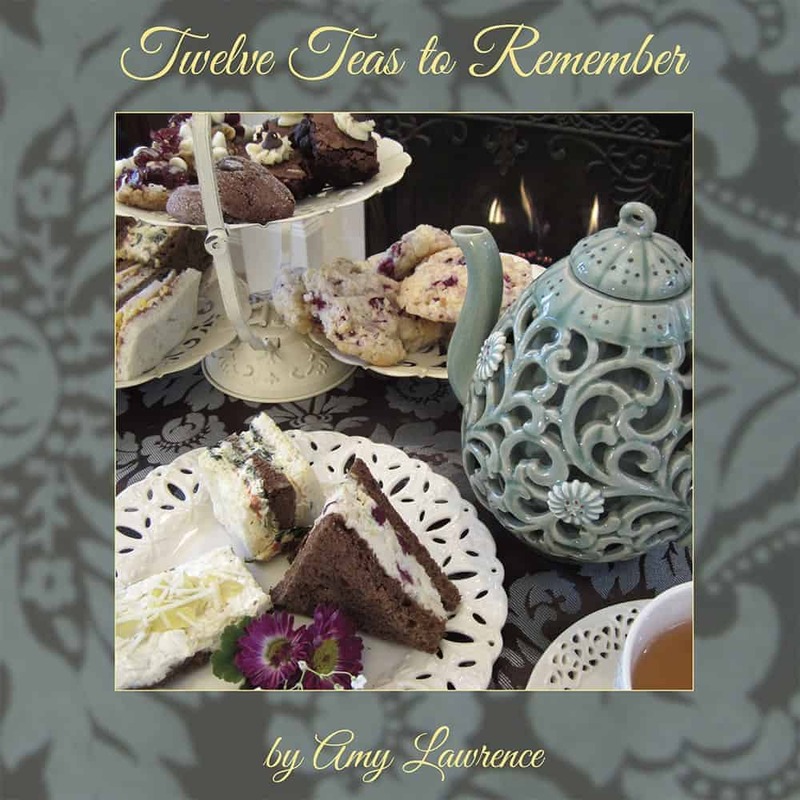 Although the recipes in my afternoon tea cookbook Twelve Teas to Remember weren’t created with healthy in mind, if you are looking for a great book on how to create the perfect tea party, afternoon bridal tea or baby shower tea, this is a great resource book for you! You can purchase the book off of my other site or directly from Amazon. Use quality fresh ingredients – what you put in the scones matter, don’t sacrifice quality! Use cold butter, don’t let it soften – cold butter makes the scones rise higher. Drain the fruit very well. Add fruit last, barely mix it into the flour mixture. Add only enough buttermilk to make dough stick together. If dough is too sticky when you pat it on the floured board, add a little more flour. Dough too dry and crumbles when you try and pat it on the floured board? Add a few more teaspoons of buttermilk. Using frozen fruit? Make sure it does not thaw out. Mix it in quickly and cut scones fast. If it thaws out, the dough is very sticky and a big mess! Make sure oven is hot and preheated to 400°. 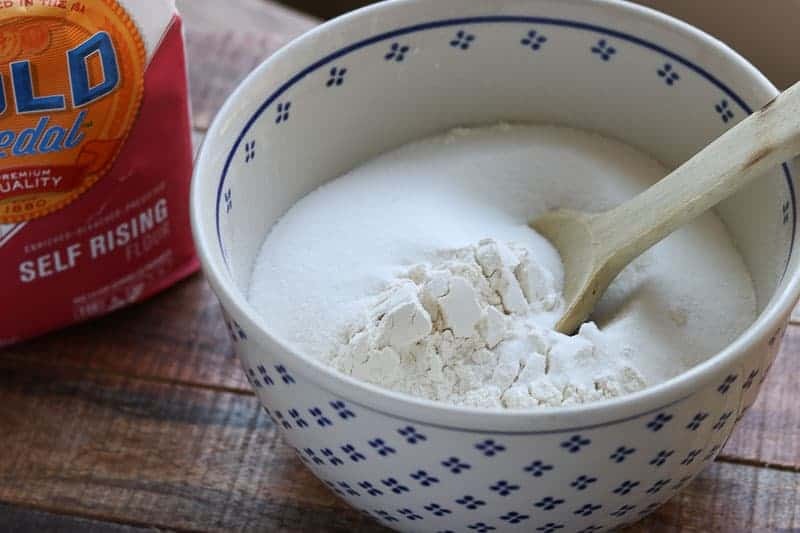 Can you substitute powdered buttermilk? I’ve heard you can but I just never do. Fresh is always best. Yes, you can. I do like fresh better but if you use frozen, don’t thaw them. Throw them in frozen, otherwise it will be a goopy mess! Yes. I have found that it’s best to freeze them after they are mostly baked. Let them cool, then flash freeze on the cookie sheet and transfer to vacuum sealed or plastic bags. When ready to reheat, just place then frozen on baking sheet, cover with foil and heat at 325° until hot (about 15-20 minutes). Yes! For this recipe, use 3 c. all purpose flour, 1 1/2 T. baking powder and 3/4 t. salt. See above for more instructions. 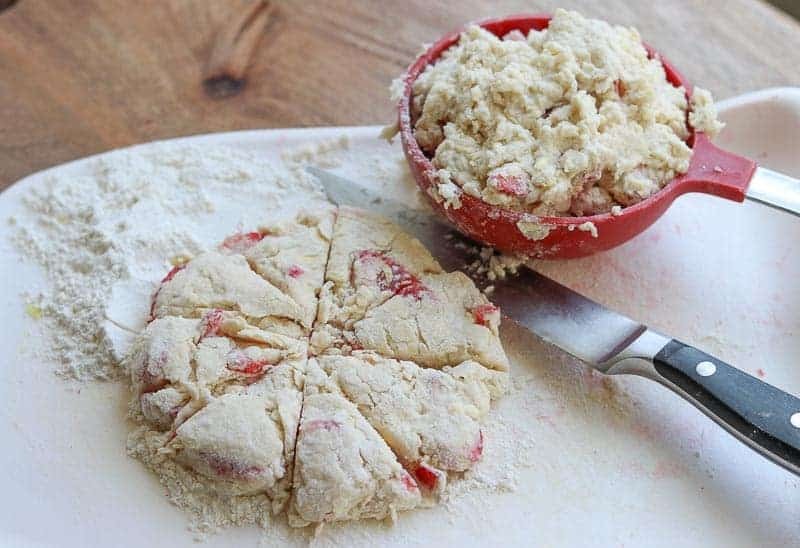 Delicious fresh strawberry scones in no time! This is a very important step! Hot oven plus cold butter equals great scones! 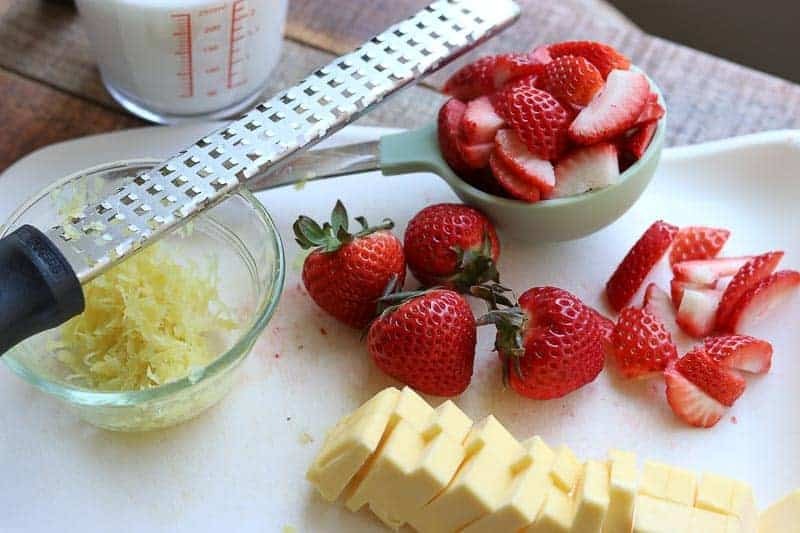 Cut the butter into cubes, slice the strawberries, measure the buttermilk, and zest the lemon with a microplane grater. Use a pastry blender or fork. Add part of the buttermilk. Only use how much you need. Start with half, then gradually add only enough buttermilk until the dough comes together. Place the dough on the cutting board. Carefully use your hands to round it into a circle. Bake at preheat 400° oven for about 8 minutes. 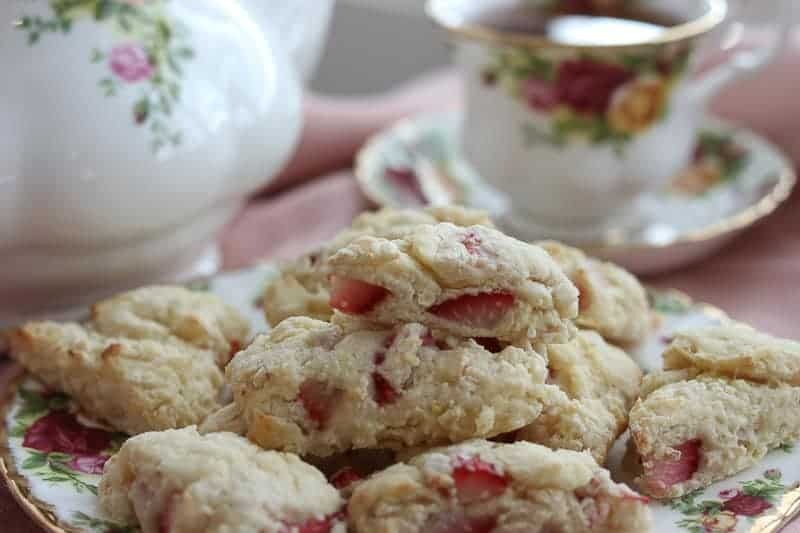 Place mini scones on parchment paper and bake about 8-10 minutes. 2 T. freshly grated Meyer lemon peel or freshly grated regular lemon peel, be sure it’s fresh! Combine self rising flour and sugar. Cut in butter with a pastry blender until mixture is coarse and crumbly. You can also put about 1 c. of the flour in a food processor , add butter and lightly pulse until crumbly. Then add back into the bowl. Add strawberries and fresh lemon zest. (Use a microplane grater for the lemon zest for best results). Add about 1 c. of the buttermilk to make a soft dough. (You’ll add the rest later if needed). Scoop off about 1 c. dough-the part that is well moistened. I actually place the moistened dough in a dry measuring cup for measurement so all the scones are the same size. Lightly flour your hands and board. Dump the 1 c. of dough into your hands and make a ball. You will probably have to push the dough together to keep it from falling apart. Lightly press ball down on a floured board until you have a round disc about 5 inches in diameter. Round the edges with your hands. Don’t overwork the dough. This is a quick bread. If you handle it too much, the scones will be tough. Cut the disc into 8 pie shaped pieces. Carefully transfer each scone onto a parchment lined baking sheet. Allow a few inches in between scones. Do this for rest of dough adding the remaining 1/4 c. buttermilk to moisten the flour mixture at the bottom of bowl. Please be sure to see note at bottom. Bake at preheated 400° for about 8-10 minutes. These do not get very brown. The tops look crunchy but they are still soft inside. Allow to cool on baking sheet. Eat some and freeze rest for another time. I have found it better to add the buttermilk in parts as you go. I first add 1 c. of buttermilk then scoop out the moistened part and make a few scones. Then I go back, add a little more buttermilk and scoop out the rest. If you add all of the buttermilk at once, the top will be sticky and the bottom part of the mixture will be dry. If you try and mix it all together it will be a big mess and your scones will be tough. Use the 1 c. dry measuring cup to measure your dough, that way your scones will all be an even size. You will probably have to “free form,” the last bits of dough into scones. If you need to add a just a bit more buttermilk, go ahead, just don’t make the scone mixture sticky. No Replies to "Fresh Strawberry Scones with Meyer Lemon"